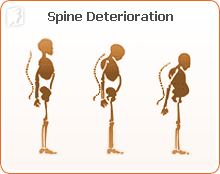 Osteoporosis is a decrease in bone density that causes fragile bones. This bone disease is most often associated with postmenopausal women because the hormonal changes that take place during the menopausal transition make women of this age more vulnerable. Osteoporosis is a “silent disease” because the bone disorder can be present within the body for years, even decades without a woman knowing. Often, osteoporosis can go unnoticed until a woman falls and fractures her wrist or hip. Even if a woman suffers a fracture, she may still go undiagnosed with osteoporosis. It can be hard to know whether or not you have the disease without x-ray testing, but there are some symptoms to look out for. Bone loss. In many cases, there is no clear indication of bone loss. Diagnoses often only occur after a bone is fractured or broken. Muscular aches and bone tenderness. Osteoporosis can cause neck and muscle pain in addition to a sensation of bone tenderness. Fractures. Women are more vulnerable to experiencing fractures. Some may fracture a bone by doing the simplest of things such as coughing, sneezing, or just bumping into a wall. Spinal deformities. A stooped posture or a hunchback position can be a symptom of osteoporosis. A loss of bone mass often results in a curved back because it causes multiple vertebral compression fractures in the spine. Loss of height. Although this can be a common feature of age, it can also be associated with multiple vertebral compression fractures. Those who have lost more than one or two inches of height should consult a doctor so that diagnostic tests can be performed. Back pain. A common symptom and complaint of this bone disorder is pain in the lower and upper back. If you have any of the symptoms above, then a professional diagnosis is necessary. The disease is both preventable and treatable. The main cause of osteoporosis during menopause is hormonal imbalance. The decreased estrogen levels affect the osteoclasts (the cells that break down bones), which cannot be maintained at a controlled level. When this happens, the body's ability to regenerate the bones is reduced, which leads to a net loss of bone mass. However, hormonal imbalance doesn't just affect menopausal women. Bone loss can also impact women in their mid-30s. Other factors that influence bone density and mass include calcium and vitamin D deficiency, poor diet, and a lack of exercise. It is important to know about osteoporosis and take appropriate measures to prevent and deal with the disease. First, attempt to treat the underlying hormonal imbalance and ensure that you consume enough calcium and other vital nutrients. An exercise routine will help keep bones strong and healthy and balance your hormones. The best way to prevent osteoporosis is to combine a healthy diet and exercise routine with the use of alternative hormone balancing medicines. American Physical Therapy Association.(n.d). "What You Need to Know about Osteoporosis". Retrieved from www.apta.org. National Osteoporosis Foundation.(n.d). "Prevention: Who's at Risk". Retrieved from www.nof.org. New York State Department of Health.(n.d). "Calcium and Healthy Bones". Retrieved from www.health.state.ny.us.